We’d love your help. Let us know what’s wrong with this preview of The Boy at the Top of the Mountain by John Boyne. Quickly, Pierrot is taken under When Pierrot becomes an orphan, he must leave his home in Paris for a new life with his Aunt Beatrix, a servant in a wealthy household at the top of the German mountains. But this is no ordinary time, for it is 1935 and the Second World War is fast approaching; and this is no ordinary house, for this is the Berghof, the home of Adolf Hitler. To ask other readers questions about The Boy at the Top of the Mountain, please sign up. What age group would you recommend this book for? not exactly about the book content, but did anyone like 'The Boy at the Top of the Mountain' better than 'The Boy in the Striped Pajamas'? I know most people prefer the second, but the former touched me in a way that 'The Boy in Striped Pajamas' didn't. This is an unfortunate book, and I regret buying it for my son as a complement to a class novel he recently read in school, The Boy in the Striped Pajamas. Spending some time reading it myself now, after seeing the strange perception of history my son developed reading the above-mentioned Holocaust "fable" in school, I have decided I won't let him read this until he is old enough to discern the blatant mistakes, idiotic language, voyeuristic sensationalism, namedropping and Disneyfication of a ti This is an unfortunate book, and I regret buying it for my son as a complement to a class novel he recently read in school, The Boy in the Striped Pajamas. Spending some time reading it myself now, after seeing the strange perception of history my son developed reading the above-mentioned Holocaust "fable" in school, I have decided I won't let him read this until he is old enough to discern the blatant mistakes, idiotic language, voyeuristic sensationalism, namedropping and Disneyfication of a time in German history that we take more seriously than the author of this book. A boy grows up in Paris with a French mother and a German father, both of whom fulfill the stereotypes of respective"national" behaviours and opinions. He soon finds himself orphaned and moves to the "top of the German mountain" to live with his aunt. When he is settled there, halfway through the novel, he realises, ALL OF A SUDDEN, that he lives on Hitler's Berghof. What follows is a farce. We get random glimpses of the decade from the mid-1930s to the end of the Second World War in 1945. "This is very good, gentlemen", said the Führer, nodding approvingly. "Now, how about security?" "I propose dividing the camp into nine sections", said Herr Bischoff. "You can see here on my plans there are separate areas. Over here, for example, the women's barracks. Over here, the men's. Each one will be surrounded by a wire fence - "
"An electrified wire fence", added Himmler." "And here?" asked the Führer, pointing to a place at the top of the map. "What is this? It says Sauna." This is the point where the fictional main character, the young unrelated boy from Paris, interrupts the discussion (between Himmler and Hitler, presumably on the Endlösung! - Can you see me shiver with anger? ), to ask why there will be no water in what the men call a shower room. Hitler,"quietly, turning away" (sic! ), asks the boy not to interrupt anymore. I am sorry, but I find this way of fictionalising Hitler beyond disgusting. Either it is completely naive, and should not be given to children in order for them not to have a distorted understanding of history, or it is not, and then I am speechless. In times like these, I expect more care and sensibility when dealing with a topic like this. Either do it properly, or write about something else, maybe something that proves less challenging for a writer of mediocre imagination and linguistic skill. But do not make money out of a hysterical, sensational interest in Hitler's character, based on a predilection for historical monsters. Or at least write for grown-ups, not children! I would not bother review this kind of book if I did not think that the level of naiveté and stupidity has reached dangerous levels, and that parents are carelessly assuming that whatever is labelled children's literature is harmless. Some things we do as a child we are proud of. Some things we do as a child we are ashamed of. Can we learn as we grow to cover the shame and only remember the good, or are we destined to bring that shame along with us until the end of our days? Pierrot is a young boy whose mother is French and his dad is German. Torn between the two cultures still in the throes of the recovery after The Great War, Pierrot finds himself with a father who drinks to excess filled with anger over Germany's loss in WW Some things we do as a child we are proud of. Some things we do as a child we are ashamed of. Can we learn as we grow to cover the shame and only remember the good, or are we destined to bring that shame along with us until the end of our days? Pierrot is a young boy whose mother is French and his dad is German. Torn between the two cultures still in the throes of the recovery after The Great War, Pierrot finds himself with a father who drinks to excess filled with anger over Germany's loss in WW 1, and a mother who tries to bridge the gap in these two cultures. Pierrot has a best friend, a neighbor, Anshel, a Jewish friend who is deaf. Pierrot loses both his parents, one to being hit by a train and the other to tuberculosis. For a time. Pierrot lives in an orphanage, but is eventually taken by his aunt, a housekeeper for Hitler to Berghof. Before leaving for the orphanage Pierrot swears he will write to his friend, Anshel, and never forget him. In the environment of Berghof, Pierrot now Pieter is indoctrinated by his awe for Hitler. Pieter is always striving to be the perfect German, never seeing what is happening around him abandoning the boy he once was for the Nazi he will grow to be. Pieter succumbs to the sin of pride, becoming so full of his own importance that he neglects those around them who have been kind and loving. Pieter becomes a true Nazi. The war years pass and Pieter becomes more and more a shell of his former self. He has lost his innocence. He has become hardened. He has become a young man full of the right he believes Hitler has to mold a nation, to eliminate problems, and to take all that he desires. Hitler has become his god. Pieter survives the war but goes on to live a life filled with regret and memories that will haunt him forever. Oh boy......THE BOY AT THE TOP OF THE MOUNTAIN......really surprised me. 1936 - Pierrot is such a good kid....at age seven, he doesn't even know the meaning of the word prejudice or hatred with a French mom, German pop and Jewish best buddy, but life as he knows it is soon turned upside down when he is orphaned and finds himself traveling alone by train from Paris to Austria to live with an aunt he has never met. Meeting up with bullies....both young and old along the way....a naive Pierrot finds himself living in a dangerous new world he doesn't understand, but is influenced by darkness and evil that changes his life....and those of others....forever. Oh Pierrot. Another short, but powerful read by John Boyne with a befitting end....and (for me) like The Boy in the Striped Pajamas....not just for young adults. ¿Me ha gustado? Probablemente. ¿Me ha convencido? No. ¿Lo he disfrutado? A medias. Sí, la cosa está complicada. El niño en la cima de la montaña era una novela que quería leer debido a lo que me había gustado El niño con el pijama de rayas. Me esperaba algo similar y al mismo tiempo que no se repitiera la fórmula, y es que justamente ha sucedido. No con un tono tan infantil e inocente, pero sí similar, y encima en la misma época... Que sí, el planteamiento es totalmente diferente, pero lo siento: ¿Me ha gustado? Probablemente. ¿Me ha convencido? No. ¿Lo he disfrutado? A medias. Sí, la cosa está complicada. El niño en la cima de la montaña era una novela que quería leer debido a lo que me había gustado El niño con el pijama de rayas. Me esperaba algo similar y al mismo tiempo que no se repitiera la fórmula, y es que justamente ha sucedido. No con un tono tan infantil e inocente, pero sí similar, y encima en la misma época... Que sí, el planteamiento es totalmente diferente, pero lo siento: no es original. Ese punto lo perdemos, Boyne. Sin embargo, sí es cierto que es más interesante que el primer libro. Pero es importante diferenciar que tan solo lo es la segunda mitad, pues la primera me costó muchísimo (no conectaba con el personaje, no veía una trama clara...). El hecho de vivir en una de las casas de Hitler y ver la evolución de un joven niño medio francés a una persona totalmente irreconocible es un largo camino que no creo que esté bien tratado, pero que sí: resulta más que curioso. No, Pierrot no me ha gustado nada. Desde el momento en el que se convierte en Pieter pierde mucho para mí y no me parece que esté justificado. La narración es pobre en ese aspecto. No me creo ese cambio, no me das motivos ni razones suficientes. Con enseñarme dos escenas clave por cada año del muchacho no voy a entenderlo mejor, ni a comprenderlo. No. En ese aspecto me han faltado muchas páginas y mucho desarrollo. John Boyne author of The Boy in the Striped Pajamas returns with another children's novel set during The Second World War. The story is about a boy called Pierrot an orphan who must leave his home in Paris and travel to Germany to live with his Aunt Beatrix who is a servant in a house calll the Berghof at the top of a mountain. John Boyne is a wonderful adult and Children's writter. In this Novel he tells the story the of the corruption of Innonence and the horrors of war that children can get caught up in. The book is extremely well written for children as it takes the reader to a time and place in histroy that should never be forgotton and I think it is a great introduction for 12 years and upwards to events of World War Two. I love how the author slips in names of people and places throughtout the stroy that will stay with the reader and when they study this period of histroy in school will be aware of the names and places. I had to keep reminding myself that I was reading a childrens's novel because there were times when I felt that the 7 year old Pierrot seemed way beyond his years and read more like a child of 12 or 13. I also thought that the author took a huge risk with the Pierrot being such a dislikable character as children tend to enjoy reading about likable characters but I see where he was going in the end and I think it will make the reader think outside the box. I also think any book that can get kids asking questions and discussing events in history is a great book. A good discussion book for youngsters but not much in this one for the adult reader. Porque é que não existem 6 estrelas? Que livro tão bom, tão maravilhoso! Grande John Boyne que não falha! Uff.. was ein Buch. Ich weiß gar nicht wirklich, was ich dazu sagen soll. Ich kann es nur jedem ans Herz legen. A very moving story about a boy who meets Hitler in person. And is influenced by Hitler's thoughts and actions. Incredibly well told! Una lectura corta, ágil y entretenida. Una historia conmovedora que te remueve sentimientos y que particularmente me ha hecho enfadarme con el protagonista hasta llegar a comparecerme de él por ser una víctima más de Hitler. Una historia donde vemos la inocencia de un niño, las influencias ideológicas y las repercusiones que estas tuvieron. Una parte de nuestra historia más reciente desde los ojos de un niño, que aunque sea ficción nos muestra la realidad que se vivió. Si te gustó "El niño con el Una lectura corta, ágil y entretenida. Si te gustó "El niño con el pijama de rayas" este libro te gustará. A short novel but intriguing and disturbing in equal measures. Forget the links to Boy in the Striped Pyjamas as this is quite a different book all together , while it is set in WW2 and has the Fuhrer , the main character is very different and the book has a bit more meat to it than the simpler fable of The Boy in the striped Pyjamas. This is definitely a good thing. The predecessor is a brilliant book but trying to replicate it wouldn't have worked nearly as well. The main character here is Pierr A short novel but intriguing and disturbing in equal measures. The main character here is Pierrot / Pieter and there is a certain amount of naivety and innocence to begin with, the story develops into one about bullys, propaganda, brain washing, and what people will do because they are told or are protected by a uniform. The path of the main character is both sad and disturbing. The loss of innocence and the rise of hatred is well written and I felt sad at the changes as the book progresses. The finish is quite poignant with brings the book nicely full circle. I really loved Boy in the Striped Pyjamas ( and Boyne's other YA war related novel Stay Where You are and Then Leave) but I was a little wary starting this as I expected a similar confused innocence book but I am glad I was quite wrong. This is another great book by Boyne and I will not hesitate to recommend it freely. Ellie Do you think it is too disturbing for 11 to 12 year olds? Paul Some parts might be depending on maturity. I’ve yet to read a John Boyne novel and be disappointed. 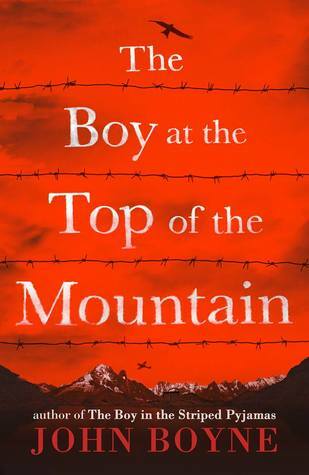 The Boy at the Top of the Mountain is another fantastic edition by author John Boyne. The story follows Pierrot Fischer, a young boy of half-German half-French descent who lives with his parents in Paris in 1936. Pierrot idolises his father, a WWI veteran who fought for Germany under the Kaiser and suffers from PTSD, and lovingly adores his mother while befriending a Jewish boy named Ansel whom the two bond over writing and stories. As the story progresses, Pierrot loses both his parents, ends up in an orphanage, and finally travels to be with his aunt Beatrix, a maid who lives in an extravagant Austrian household outside Salzburg. Little does Pierrot know the house belongs to Adolf Hitler, and Pierrot will descent into a persona of a German nationalist under his influence. By the time the book reaches its epilogue, Pierrot will question everything he ever believed and have to come to grips with the unfortunate choices he has made. Pierrot acts as a personification of the humiliation, anguish, and desperate need for redemption Germany as a country faced post WWI with the treaty of Versailles. It's little wonder why German citizens felt the need to go to such aggressive methods based on this. Pierrot begins by opening celebrating his duel background and his friendship with Ansel, but through a rather torturous discovery of just how vulnerable he has become, he lashes out into something he believes will aid him in purpose and strength, regaining and reforming that identity he lost. He not only loses himself, he becomes monstrous to people that under other circumstances he'd most likely be kind and accepting of. We as an audience essentially want to slap him a few times in these scenes. It's through this character study that we can see how people in societies turn their vulnerabilities into something super dangerous, enacting policies and making decisions in an illogical manner. Pierrot's own questions with Katerina regarding the idea of a "good citizen" versus a "patriot" and just what that really means are a good example of this dynamic. So is the power Pierrot feels when he puts on his own uniform when he grows in delusion with each purposeful choice he makes. Boyne is great at looking at the character analysis of average people who in turn make horrible decisions based on tragic circumstances and vulnerabilities. Más bien un 3,5 quizá. Pronto habrá reseña en el blog. Cognitive dissonance, my old friend. I really hated this book but at the same time I literally could not put it down. From the very beginning I had a gut feeling it was going to make me sad. But it also made me angry. Experiencing those conflicting emotions simultaneously made me uncomfortable and I think that is, simply put, what makes Boyne's writing so compelling. He writes about the human condition with such audacity and incisiveness, yet its also clever and engrossing. In this case we have Pi Cognitive dissonance, my old friend. He writes about the human condition with such audacity and incisiveness, yet its also clever and engrossing. In this case we have Pierrot, a boy of 7 with a French mother and a German father living in Paris in 1936. His father, dogged by his demons from WWI, has become an alcoholic and abusive. He (I believe) either committed suicide or was so inebriated that he fell in front of a train leaving Pierrot and his Maman to fend for themselves. Shortly thereafter she succumbs to tuberculosis orphaning Pierrot. This is in the blurb and not a spoiler. What's important to note here is Pierrot's characterization. His best friend is the deaf Jewish boy downstairs, Anshel, who writes stories and gives them to Pierrot to critique. Their bond is a palpable one and they even develop their own language. He is small for his age, is constantly ridiculed for it and the cherry on top was how Boyne ensnared me with how sweet, kind and tender-hearted he is which made all the suffering exponentially harder to stomach. After a brief time with Anshel's family he's sent to an orphanage where he was bullied before his long lost aunt sends for him. Beatrix is the housekeeper at the Berghof. Things rapidly deteriorated from there, as you can imagine. He grows up under the diabolical tutelage of the Führer in the heart of the Nazi regime from the ages of 7 to 16. Formative years, to be sure. What I found so riveting was this notion that Boyne's playing with of power and corruption and how easily, given a certain set of circumstances, they can alter a person. Beatrix in her desire to do right by her brother set in motion a chain of events that irrevocably changed people's lives, altering sweet little Pierrot in chilling ways and transforming him into loyal Pieter, Oberscharführer, who's unruly and capable of monstrous deeds. Which leads to the question of can reparations be made? And at what age are we to be held accountable for our actions? I'm certain everyone will have a different experience with this book. I lean towards optimism and perseverance, but regardless, anything that makes me think, examine and evaluate this much is worthy of 5 stars despite the fact that I still feel a bit sickened and in desperate need of some fluff. "Je naozaj také ľahké skaziť nevinného?" Tenía muchas ganas de leer este libro hace tiempo, y aunque no estaba en un lugar prioritario en mi lista de pendientes, lo empecé a leer para salir de un bloqueo lector. Si bien al principio fue un poco lento y no terminaba de atraparme, pasada la mitad, me lo leí de una pasada. En este libro nos cuentan la historia de Pierrot, niño medio aleman medio francés, que termina viviendo con su tía, cuando sus padres mueren, y ella es el ama de llaves en la casa de Hitler. A lo largo del libro vemos l Tenía muchas ganas de leer este libro hace tiempo, y aunque no estaba en un lugar prioritario en mi lista de pendientes, lo empecé a leer para salir de un bloqueo lector. Si bien al principio fue un poco lento y no terminaba de atraparme, pasada la mitad, me lo leí de una pasada. En este libro nos cuentan la historia de Pierrot, niño medio aleman medio francés, que termina viviendo con su tía, cuando sus padres mueren, y ella es el ama de llaves en la casa de Hitler. A lo largo del libro vemos la pérdida de la pureza de este niño, como lavan su cabeza, quiebran su inocencia y termina asumiendo como correctas cosas que están muy mal. John Boyne is the author of The Boy in the Striped Pajamas, a book that showed the horror of concentration camps through the eyes of a child. In this new novel, Boyne has written a story in a similar vein (this time with more grit/violence) that shows the innocence and naiveté of childhood and how easily it can be corrupted. This is a short novel (220-ish pages) but it's packed with a lot of food for thought as it tackles some serious issues. While this book is written for a youth audience I'd suggest it for readers 12 years of age and up since there are some violent scenes which, while they would make for some great discussion with tweens/teens, may be too much for more sensitive readers. In this new novel, Boyne deftly juggles the horrors of WWII with the innocence of childhood. He showcases how hatred and power can trounce innocence especially when one sees no other worthy options. He includes some touching scenes and some that are hard to witness but Boyne's words bring the reader into the heart of the issues that face this young boy and his unique living conditions. I enjoyed seeing Pierrot's progression from likable protagonist who has lost so much to witnessing his metamorphosis into a very different person. Gradually, Pierrot/Pieter accepts Hitler's teachings, eagerly wanting to have the acceptance, leadership and attention that Hitler could provide, as he transforms into Hitler's little minion. While it was equally sad, maddening and frustrating that Pierrot was such a blind follower to Hitler, Boyne shows how this progression was possible with Pierrot not wanting/needing to think for himself or to think about the ramifications of his decisions. I went through many emotions regarding Pierrot from wanting to shake him, hug him, help him and pity him but more than anything I wanted him to come to his senses. Overall, this was a well-written and enlightening read that I read in two sittings. While the book is a little slow taking off the amount of discussions that it can provide for young readers is well worth the wait. It tackles many important issues including friendship, death, bullying, the loss of innocence, standing up for what's right and learning to find your own way in spite of the powers around you. Leí "Epílogo" y dije: "qué raro que no me hizo llorar este libro"
Bueno, otro libro necesario. Súper rápido de leer; aunque te canta las cosas como eran, no te angustia, porque no te las _muestra_, y eso permite que la lectura sea fluida. No busca redimir a los malos (no, no hablo de Hitler, hablo de otros malos, aunque a ese tampoco :p) y eso me gustó. Es una narración bastante descriptiva y si bien eso de a ratos te aleja del personaje principal, al final es buenísimo porque creeme, te Leí "Epílogo" y dije: "qué raro que no me hizo llorar este libro"
No busca redimir a los malos (no, no hablo de Hitler, hablo de otros malos, aunque a ese tampoco :p) y eso me gustó. Es una narración bastante descriptiva y si bien eso de a ratos te aleja del personaje principal, al final es buenísimo porque creeme, te sentirías horrible si lograras empatizar con él. Bah, al menos yo no pude ni empatizar ni simpatizar, no sé ustedes. ¡Me había olvidado de marcarlo como leído! Me encantó demasiado♥ ya ni me acuerdo en qué mes lo leí JAJAAJJA creo que en Junio..
Es konnte mich nicht ganz so (emotional) packen, wie "Der Junge im gestreiften Pyjama",allerdings hatte mich das ja auch so sehr umgehauen, dass es mir von Anfang an klar war,dass es schwierig würde da ranzukommen. Dennoch halte ich auch dieses Buch von John Boyne für sehr lesenswert. Auch hier wird wieder viel mit der kindlichen Naivität und der (vermeintlichen) Unwissenheit gespielt,jedoch entwickelt sich diese hier am Ende,im Gegensatz zu der Geschichte von "Der Junge im gestreiften Pyjama",zu Es konnte mich nicht ganz so (emotional) packen, wie "Der Junge im gestreiften Pyjama",allerdings hatte mich das ja auch so sehr umgehauen, dass es mir von Anfang an klar war,dass es schwierig würde da ranzukommen. Innerhalb von rund 2,5 Stunden durchgelesen, hat mich dieses Buch mit einem sehr, sehr nachdenklichen und auch recht verstörten Gefühl zurückgelassen. Ein Buch, das man gelesen haben sollte - ebenso wie "Der Junge im gestreiften Pyjama". Me ha gustado, se lee con facilidad y es interesante ir viendo la transformación del protagonista, aunque me ha parecido poco profunda para lo que trataba,... o a mi no me ha llegado. I have had this book waiting in the tbr pile for ages. I should have read it much sooner. I really enjoyed this take on a war story. Poor Pierrot, so nieve, such a tragic start in life, his father run over by a train and then his beloved mother dies of consumption. His only friend is the little boy downstairs but his family cannot afford to take Pierrot in and so he is sent off to an orphanage. It is all pretty awful for him. Then, via a traumatic train journey, he ends up in Hitler's Berghaus o I have had this book waiting in the tbr pile for ages. I should have read it much sooner. I really enjoyed this take on a war story. Poor Pierrot, so nieve, such a tragic start in life, his father run over by a train and then his beloved mother dies of consumption. His only friend is the little boy downstairs but his family cannot afford to take Pierrot in and so he is sent off to an orphanage. It is all pretty awful for him. Then, via a traumatic train journey, he ends up in Hitler's Berghaus observing the war from the point of view of the Nazi elite. This book is, in a way, related to the Boy In Striped Pajamas in that the main character is a child looking on at the Nazi activities and not fully understanding what is going on. The author, whom I admire greatly, had played a clever trick as the two books are just ever so slightly linked. I loved the way that Pierrot, who becomes Pieter is gradually indoctrinated and how we see how easy it is to be caught up in the mass hysteria of war.